A golf swing for beginners and the low handicap golfer is based on sound fundamentals. The difference between golf shots made by the beginner and those made by a low handicap golfer is basically how each golfer applies basic fundamentals (techniques and mechanics). The low handicap golfer considers the golf club as a tool, an extension of the body. The easier the tool can be integrated with the thumbs and forearms, the easier it is to make quality golf shots. The main objective for the QATSPY system is to establish the best practice for using the golf club with the body. During a period of seven years, I spent long hours every day in my backyard in Madison, MS, accumulating a large amount of raw data that was placed into three boxes. Two large boxes were labeled “THIS DOESN’T WORK.” The rest of the data that was collected, categorized, and placed into a smaller box was labeled “THIS WORKS.” The box that was labeled “THIS WORKS” became The ESPY Golf Swing Coach. The word “COACH” in the title of the book is critical not only to the book but to the golfer as well. Golf, for all practical purposes, is an individual sport. The golfer must develop the ability to self-diagnose and self-coach. As part of self-coaching, the golfer must develop sound fundamentals for proper muscle memory, instead of only swing thoughts. Perception in golf does not generally equal reality. Golf coaches and instructors are important to the golfer to help build fundamentals. But only the golfer can experience the required feel for muscle memory via the experience of course play. The biggest opportunity for the golfer to improve their golf game is having the ability to self-analyze and make the necessary corrections. One of the focus points of Synch, Protract, and Yaw is the mental checkpoints the golfer can use during the practice swing. The ESPY Golf Swing Coach allows the golfer to use the thumbs, elbows, upper arms, and the club handle as indicators to make the needed corrections. Some of the best golf tips that the beginner golfer can use are using the lead thumb and the club’s handle to stay on plane. The correct swing plane is usually flatter than what the golfer thinks. Using too steep of a swing plane is a habit that a golfer takes from the baseball swing. Most batters bring the bat back, where it is above the trail shoulder. The correct swing plane for the golf club is to place the club shaft either at or just below the trail shoulder. The golfer will realize more accuracy and distance by swinging on a flatter plane. The correct swing plane is selected by measuring and comparing the forearm (from the elbow to the knuckles) with the upper arm (the shoulder to the elbow). Case No. 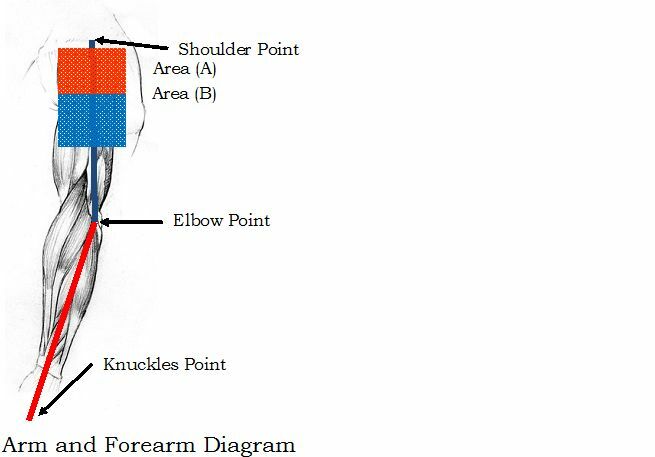 1- If the forearm is longer than the upper arm, the target point is the red area (A), at the shoulder. Case No. 2- If the forearm and the upper arm are equal, the target point is the blue area (B), just below the shoulder. A great article written by Kiel Alderink, instructor at The Todd Sones Impact Golf School in Vernon Hills, Illinois, reinforced this technique. He writes about how to compare the forearm with the upper arm to establish the correct swing plane also.